Chances are at least a few of your friends and family members are on the keto diet or have tried it. If you're anything like me, the mere thought of bidding adieu to pasta and bread probably sends chills down your spine. But if you're looking for a balance between getting the benefits of the keto diet without foregoing your carb fix altogether, keto cycling may be right up your alley. But first things first: What is keto cycling? Although it's essentially a form of the keto diet, it hasn't gotten nearly as much attention. "Keto cycling differs from the classical ketogenic diet because it allows more customization," registered dietitian Robert Santos-Prowse tells SheKnows. "With a strict ketogenic diet, you need to restrict your carbs to minuscule amounts all the time. "With a cyclical approach, you are allowing yourself the freedom to enjoy some carbohydrates on a regular basis but still get the benefits of the ketogenic diet." 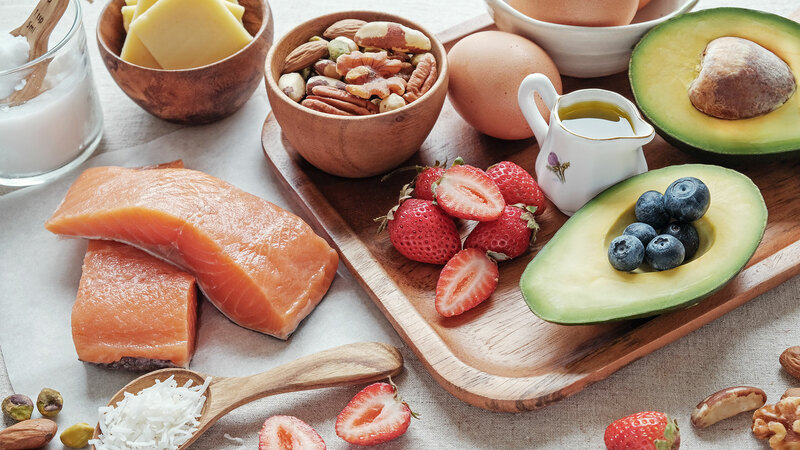 Although doctors and nutritionists don't have an agreed-upon protocol for keto cycling, Alex Jatzke, lead dietitian at Simplex Health, recommends five to six days of a strict ketogenic diet followed by one or two days of higher carbohydrate intake. "While the ketogenic diet requires a more long-term low-carbohydrate and high-fat diet, keto cycling allows for more flexibility with carbohydrate intake while still resulting in the long-term health benefits of a ketogenic diet," Jatzke explains. If you've tried the keto diet and found it too difficult to maintain (or you have a hunch that it will simply be too restrictive), Jatzke tells SheKnows keto cycling may be beneficial in these situations. Additionally, she notes that "cycling in and out of carb restriction" could be particularly beneficial for balancing hormone levels in women. "The cyclical ketogenic diet is very effective because of the ketogenic diet itself. The main benefit of a cyclical approach is that it improves the sustainability of the diet," Santos-Prowse says. Although the keto diet is effective for weight loss, blood glucose control and blood pressure management, it's incredibly restrictive, he adds. "You have to restrict your carbohydrate intake to the equivalent of less than one apple a day. That's hard to stick with long-term," Santos-Prowse explains. "A cyclical approach allows you to add in a bit more carbs on a regular schedule." More: What Is "Keto Flu," & How Do You Treat It? "If you have a tendency towards binging behaviors, keto cycling should be avoided," she adds — and if you have a history of eating disorders, Jatzke says a strict ketogenic diet is generally not recommended. In fact, she recommends that people with any type of preexisting medical condition consult with their doctors before starting keto cycling or the keto diet. But not all doctors and nutritionists are on board with the keto diet. "I recommend keto cycling over the keto diet if clients are set on some sort of fad diet," Sam Olmsted, consultant for All Inclusive Health, tells SheKnows. "However, it’s much more beneficial to simply have a balanced meal. Stick to whole grains, protein and vegetables while avoiding processed foods."